Note: this column contains spoilers for a 35-year-old film. If you haven’t seen Time Bandits yet, well, I don’t know what to tell you. A dyed-in-the-wool film fan never forgets their first experience when a movie makes a profound effect on their psyche, where it’s more than just two hours of entertainment or an excuse to get out of the house. Although I was able to experience some classics in my youth – The Empire Strikes Back and Fantasia come to mind – the bulk of the movies that I saw during my elementary school years were pretty much lightweight, disposable fare. 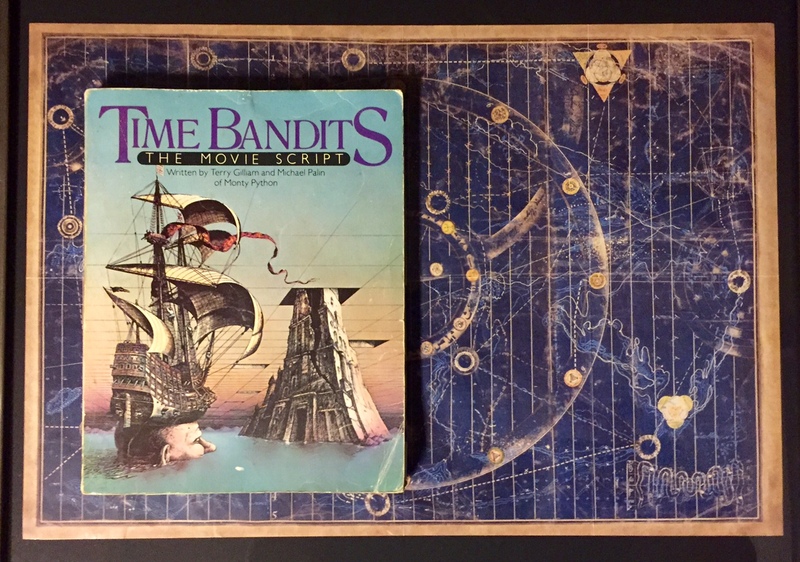 The way I viewed movies changed in late 1981, when I saw Time Bandits in the theater. This film blew my nine-year-old mind with its everything but the kitchen sink storyline, imaginative set pieces, six British dwarves and a young boy as the de facto lead actors, and a bleak but not unhappy ending. It definitely helped that I was around the same age as Kevin, the protagonist of the film, and, like Kevin, I spent hours creating dioramas with a random assortment of figurines, miniature vehicles, and building blocks, as well as gathering historical facts through encyclopedias with pictures – lots of pictures. There was no way that my parents were going to let me see this movie more than two times in the theater, and it would be three more years before a VCR entered our house, so they gave me the next best thing: the published script for Time Bandits, complete with movie stills, behind-the-scenes photos, and director Terry Gilliam’s storyboard art. The book’s spine is damaged, the cover has been yellowed by the sun, several pages are dog-eared and held together by paper clips – and I wouldn’t have it any other way. I must have read the script twenty times over, memorizing certain lines and descriptions of key scenes. The inclusion of extended and additional scenes that didn’t make it into the final cut of the film was like finding gold coins between the pages. Gilliam wrote an entire sequence with dialogue devoted to the “Your Money or Your Life” game show, only seen in the background for a few seconds at the beginning of the film. Also fascinating is a filmed but deleted (and now lost) scene featuring two arachnid ladies who attempt to add Kevin and the bandits to their cavernous web of previous explorers. Gilliam and co-writer Michael Palin have fun with the script’s “special features”, adding humorous biographies of the six bandits, and inserting gags into the script’s technical guide (“Pull Out: this is what the backers do when they’ve seen the first rough cut of the film.”) Most importantly, the script includes an explanation concerning Horseflesh, the talked-about but unseen deceased member of the bandits (in a nutshell: Gilliam didn’t want the Disney comparisons/possible lawsuits associated with seven dwarves as the main characters.) For those who are still upset over the ending, where Kevin’s parents die by touching microwaved Evil, Gilliam added “or is it…?” under THE END. Fast forward to fall of 2014. Time Bandits makes the list of The Criterion Collection’s new releases. When I see the news in my Facebook feed, I ask a practical question to my virtual peers: “Does the booklet fold out into the map?” The affirmative replies and “Likes” seal the deal – it’s time to upgrade to Blu-ray and add another piece of movie memorabilia to my wall. While my diplomas sit in an unused desk drawer, my Blu-ray booklet/map is framed, hung in a common area of my house, waiting to be recognized by a fellow Gilliam aficionado. As Executive Producer George Harrison’s song played over the end credits, and red-toned stills of characters from the film appeared, I felt like Kevin going through his Polaroid pictures of his amazing journey, and, by extension, my younger self experiencing the movie for the first and second time. “What did I just watch?” “Who is the eccentric genius that came up with this story?” “Are there more insane movies like this out there?” Not a bad gateway at all, if you ask me. Greg Carlson is a film fan and memorabilia hunter who frequents Scarecrow Video on a regular basis. His top three films are (in random order): Time Bandits, Repo Man, and Taxi Driver. For more pop-culture musings, follow him on Instagram at gregario72. ← New Releases for June 7!